Day 12: Cork to Bantry. The steady rain that blew in last night intensified and seemed to stall over southern Ireland. 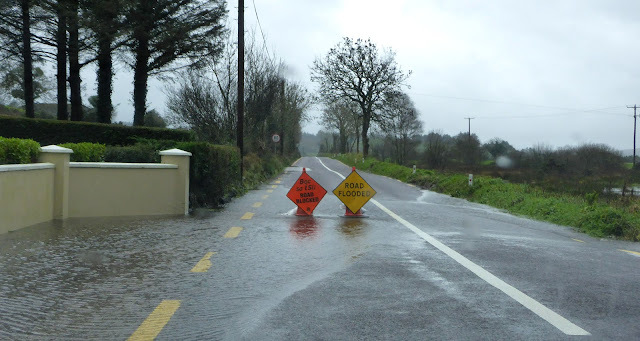 As we were preparing to leave Cork this morning, looking forward to our pleasant drive along scenic country roads through picturesque little towns, hotel employees issued the same warning we've been given frequently in the last couple of weeks: When there's heavy rain and high winds, try to stick to motorways or other major roads. Avoid country roads because the drainage is poor and there's a risk of trees being blown down. With the way this rain was pelting, there was little likelihood we'd see much on our scenic route anyway, so we decided to pass them by in favor of a better route. Cheerio, Clonakilty. So long, Skiberreen. Another time, Drombeg Stone Circle. Though there was no M-branded motorway (limited access divided highway), we went with the next best thing and plotted a course that would keep us on N-roads as much as possible. The Ns would only take us so far, of course, and near Farnhanes, we had to leave N-22 and venture off onto a regional road, the R-585. Where's a boat when you need it? As we approached the coast, the wind whipped itself into a blustery frenzy. And the flooding was more widespread. It was the kind of weather and road conditions that make 40 mph feel like speeding. Every low place had become a lake, every uppity stream a river. With large swaths of pastures flooded, sheep had crowded into any little corner of higher ground. Rivers and streams, paying no heed to their usual boundaries, sloshed over the land at will, sometimes with only a small berm holding them back from the road. Staying over there or coming over here? This part of Ireland certainly lived up to its nickname today. Wild Atlantic Way indeed. Exchanging the tiny Mii for a little heavier car yesterday felt like a piece of good luck. Arriving in Bantry, we checked in at our hotel, happy for an underground garage in which to unload our belongings. Tomorrow we hope the weather will cooperate and allow us to backtrack a bit to see some of what we missed today.